Somehow, you can meticulously connect each cable from your PC to your various gadgets and peripherals, carefully ensuring that they don't twist or overlap, and yet within minutes the back of your PC will look like a vinyl-coated mound of spaghetti. Even an average PC setup has enough cables to drive you crazy. You have a power cord for the PC itself, plus another for the monitor, and yet another for a printer. Then you need to connect the printer to the PC. You have a cord for the keyboard, and another for the mouse. 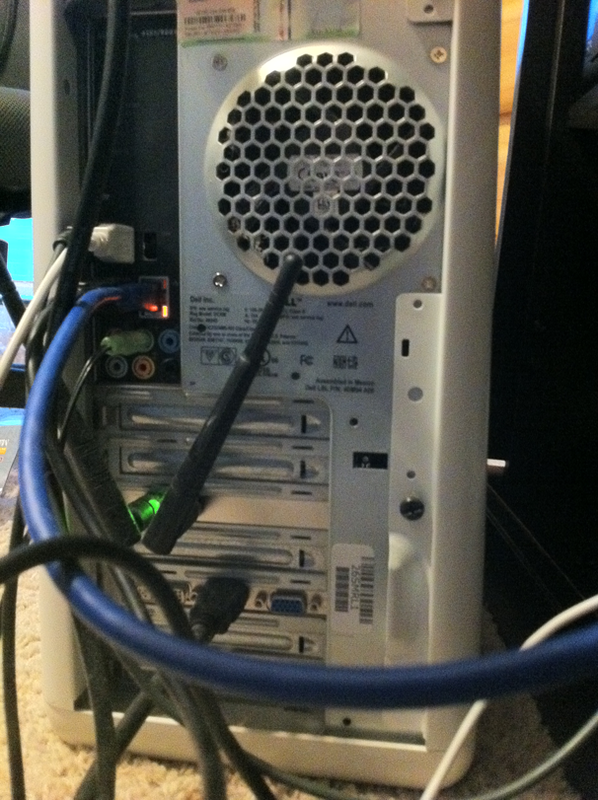 The speakers require a connection to the audio jack; and if they're decent speakers, they'll also have a power cord. That's at least eight different cables, and we haven't even gotten into external USB drives, Webcams, headsets, and other gadgets. Does your desktop look like this? It's okay. We can help. It doesn't have to be that way. With only a few simple steps--and perhaps a cable-management aid or two--you can tame the rat's nest and make your web of cables look pristine. First, you need to untangle the jumble of cables. 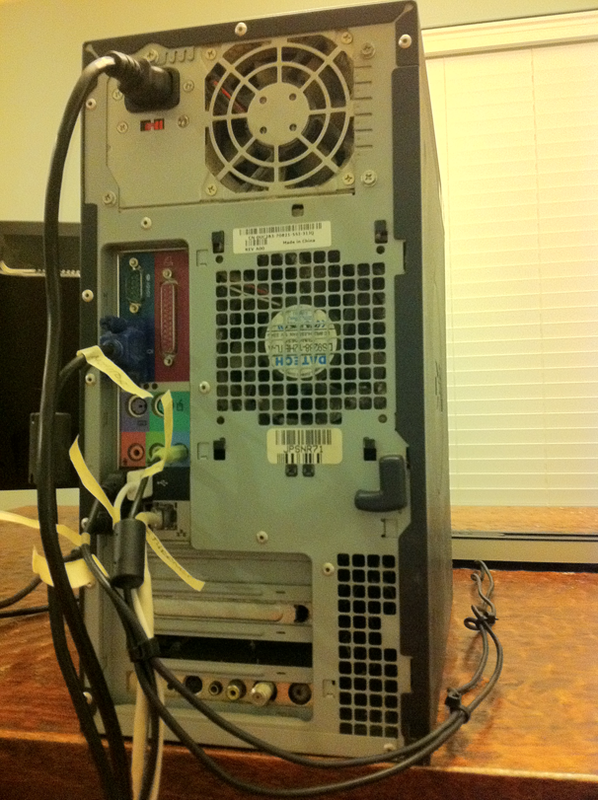 Start by completely powering down the computer, the monitor, and all attached peripherals. You're going to be disconnecting and unplugging everything anyway. Sifting through the mess can be frustrating, and you might be tempted to use the brute-force method and just start yanking. To avoid damaging any cables or breaking any devices, however, I recommend first disconnecting the cables--at least from the PC side, but preferably from both ends if possible. Lay each cable out neatly next to the device to which it belongs. Now you're back to square one, and you can begin connecting everything again--the right way. Now that you've untangled the cables so that they no longer resemble some sort of warped Rubik's puzzle, you need to take the time to label them. Trust me: It will simplify life in the long run. Eventually you'll need to replace or troubleshoot something, and you'll be thanking me for prodding you to label your cables. Attach a label to each cord or cable describing which device or peripheral it connects. I recommend using a label maker to create nice, legible labels. You don't need to be that fancy, though; writing a label on a piece of paper and using clear tape to attach it, or attaching strips of masking tape and writing directly on them, will do the trick. Just make sure that the labels are easy to read, or you will create a whole different kind of frustration. Take your freshly labeled cables and begin the process of reconnecting everything. The difference is that this time you'll have a system for keeping the cables in line and avoiding the rat's-nest look. The idea is to tie the cables together to keep them neat and tidy. Remember, though, that you have different types of devices--audio peripherals such as speakers or headphones, input peripherals like the mouse and keyboard, and so on--and those devices are located in different areas, such as on the desktop, under the desk, or on a shelf. Think about the purpose and location of your devices, and come up with a plan for how to tie the cables together. There is no one right answer, but the solution should make sense to you. You can find a variety of cable-management aids for grouping the cords together. 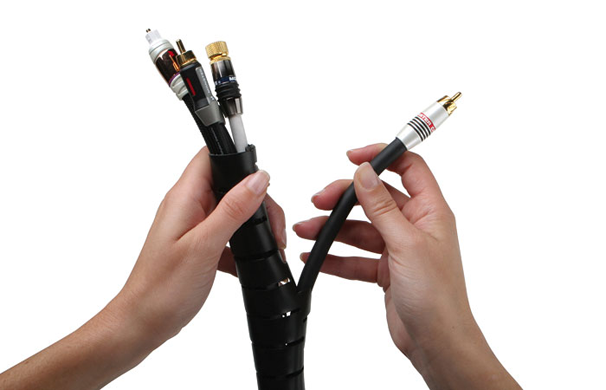 The Cable-It system from Monster gives cables a professional look, while still providing enough flexibility for you to easily split a cable out from the bunch once it reaches its destination. You can also get devices like Acoustigrips from Burton Technologies, or Legrand's Cable Clips or Bungee Wraps. Of course, zip ties are a time-tested and cost-effective choice. You can buy 100 for about $5 if you shop around. Simply secure a zip tie around your cables every 6 to 8 inches, and the cords will be nicely organized. At this point, your cables are untangled, properly labeled, and routed from Point A to Point B. Although the cables look a thousand percent better than when you started, the simple fact that the cables are visible at all can be an eyesore--especially in an office. You can put the finishing touch on your cable-management project by concealing the cords so that they blend in for a more aesthetically pleasing environment. Legrand offers a complete line of products such as the CableMate Cord Organizer that let you run cables along baseboards, or across the wall hidden within a molding. Don't you feel better now? You can look at the back of your PC and the plethora of cables and cords with pride rather than having a panic attack at the thought of figuring out how to disconnect and replace your keyboard.